Silicone rubber is widely used in medical, automotive, aerospace, electrical and industrial applications due to its flexibility over a wide range of temperatures, compressions sets, and viscosity and chemical resilience. As the need for LSR molding increases, so do the requirements for better performing injection molding machines to meet the demands for more complex shapes and high accuracy LSR parts. Sodick offers a dedicated design for LSR machines with the V-LINE Plunger SIL-PRO series. Through our breadth of experience in ultra-precision thermoplastic injection molding machines, the SIL-PRO series provides outstanding performance for a wide range LSR molding needs. A dedicated and optimum design for liquid injection molding. Has the capability to handle materials from 2.00 cP super low viscosity to gumstock. No short shots or overpacking. Flashless molding is capable, for example a 5,000 shot for cold deck 2-cavity o-ring shows zero minimum cushion deviation. Exceptional injection acceleration and deceleration resolution with a velocity profile in an increment of 0.1mm/sec (0.004”/sec). Minimizes weight and size deviation with a minimum of 50 intentional short shot showing a standard deviation of 0.0019. While metering by small diameter transfer screw, screw position is stationary to provide a very stable material density. Screw reciprocates while metering. 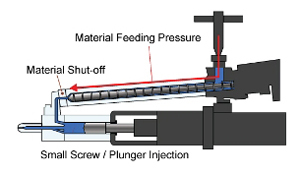 Material feeding pressure from pump is applied from screw to nozzle. 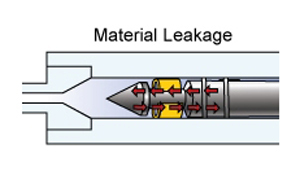 The V-Line Plunger System is equipped with a patented backflow prevention design, which is mechanically engineered to shut off the material feeding pressure before injection, thus an "exact dosing" system. The V-Line Plunger System is built to provide an exceptional low speed, low pressure injection control. 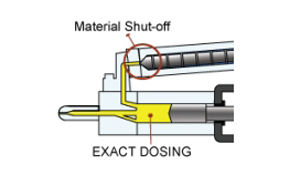 It is extremely difficult to control low viscosity material shot size in a conventional reciprocating screw system. The check ring is at an open position when metering is finished. 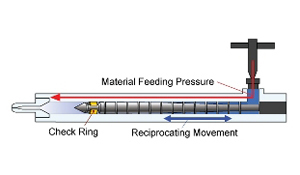 The material leakage at injection is evident due to the feeding pressure from screw side, in which pressure has to be compensated to close the check ring.